After my visit to David Myers' Pizzeria Ortica at the end of April, I asked myself if it was finally time to check out its spiritual counterpart up north, Pizzeria Mozza. The pizzeria is certainly one of the most sought after destinations in all of LA--this despite having been open for two years. In fact, we arrived at 3:40 in the afternoon, and the place was packed (see photo below). 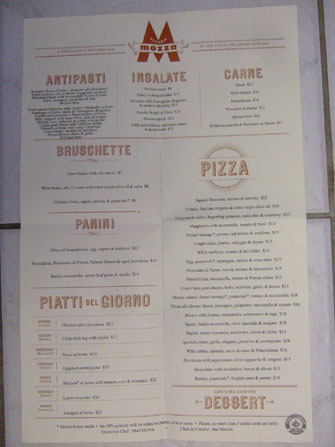 For more details about Mozza's history and founders, please see my post on Pizzeria Mozza's sister restaurant, Osteria Mozza. The space was positively buzzing when we opened the door. 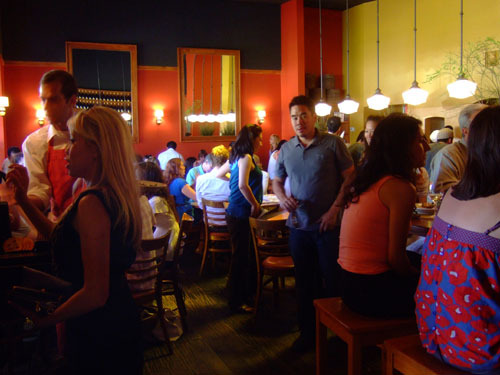 The bar, next to the entrance, was packed, as was most of the yellow and orange dining room. We were seated after waiting around ten minutes, which actually wasn't too bad. Our seat along the far wall gave us a good view of the open kitchen (second photo), and the tight seat spacing acquainted us with our neighboring diners. 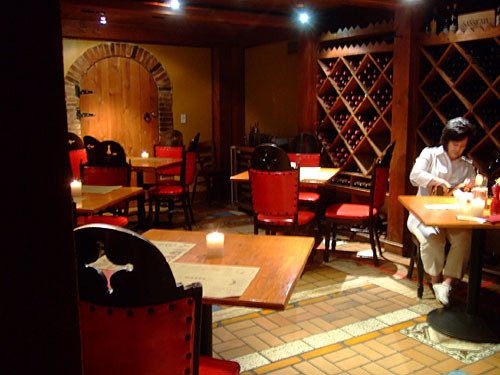 For a more serene and less noisy experience, you can try to book the Jack Warner Room, a historic space (and part of former the Alessi Ristorante) that accommodates up to 18 patrons in a wine cellar-esque environment. Mozza's menu features classic Italian fare, with the pizzas, of course, taking center stage. There were a lot of items I wanted to try, thus giving the place a good amount of "replay" value, so to speak. 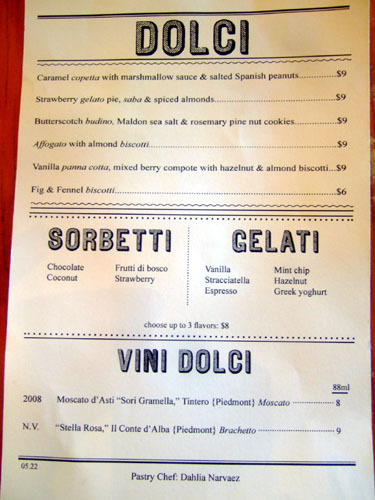 The menu's reverse side is the wine list, which is value-priced and overwhelmingly Italian. Click for larger versions. 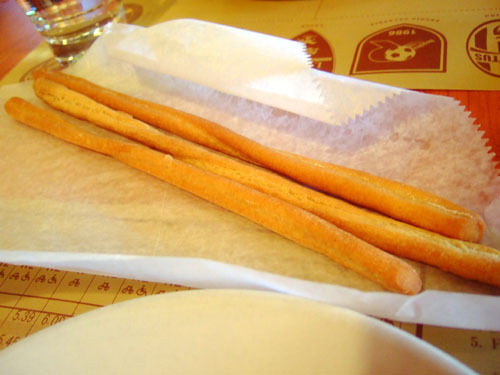 These long, crunchy breadsticks (grissini) take the place of conventional bread service. 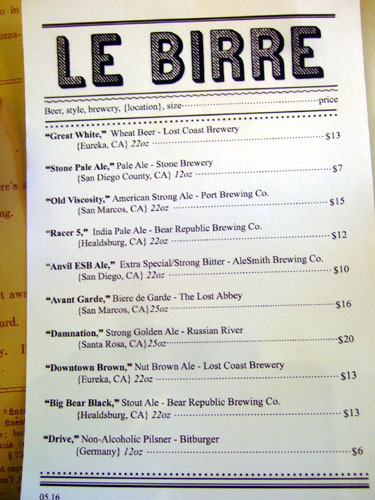 We were in a beer mood, so decided to order a couple from Mozza's small but interesting list (click for a larger version). 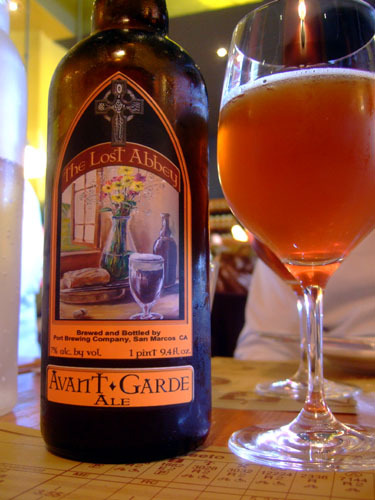 The first was the Avant Garde, a Bière de Garde ("keeping beer") from The Lost Abbey Brewery in San Marcos, CA [25oz, $16]. This was a farmhouse style ale, with notable earthy aromas backed by a bready malt flavor and a mild hoppy bitterness--quite good. 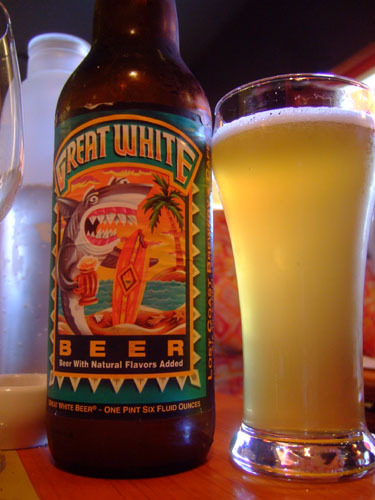 Next up was the Great White, a witbier ("white beer") from Lost Coast Brewery in Eureka, CA [22oz, $13]. I'd actually had this beer on my last visit to Mélisse. I enjoyed it then and did here as well--a refreshing brew, with lovely, zesty notes of citrus and herbs, all over a backdrop of wheat. This was a heavier preparation of asparagus than I'm accustomed to. Since the asparagus was done in an al forno ("from the oven," baked) style, it had a soft consistency with a sweet/bitter flavor accented by hints of smoke--a bit different, but still tasty. 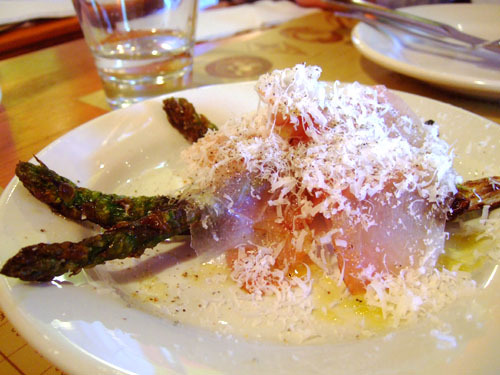 Offsetting the vegetal notes of the asparagus was speck (a type of ham from northern Italy), which provided a nice salty contrast, and the cheese, which added a subtle gravity to the dish. 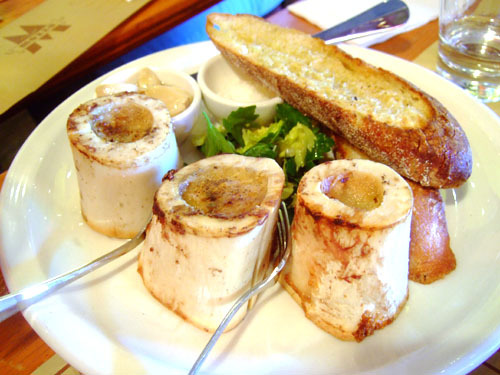 As expected, the bone marrow was quite fatty, quite unctuous on its own. Its accoutrements made all the difference in the world here. The use of an herb salad, salt, and sweet garlic really tempered the weight of the marrow, and when eaten all together with the included bread, made for a superb combination. I preferred this to a similar version I had not too long ago at Church & State. Now it was time for the pizza and naturally, I had to start with the classic margherita. 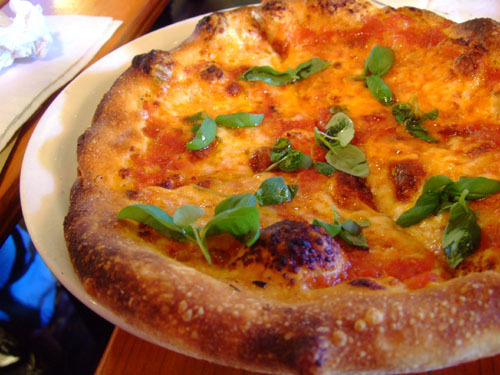 The margherita is just about the most traditional pizza available, and consists of tomato, mozzarella, basil, and extra virgin olive oil, cooked in a wood-burning oven. I quite enjoyed the tanginess of the tomato base (made from San Marzano tomatoes I assume), and how that played with the mozzarella, which added weight and character to the dish. The pizza had a nice basil tang, but I would've liked the herb's presence to have been stronger. The ever-important crust had a nice crunch to it, and I preferred it to the slightly too-soft version at Pizzeria Ortica. Overall, a very solid interpretation of a classic. 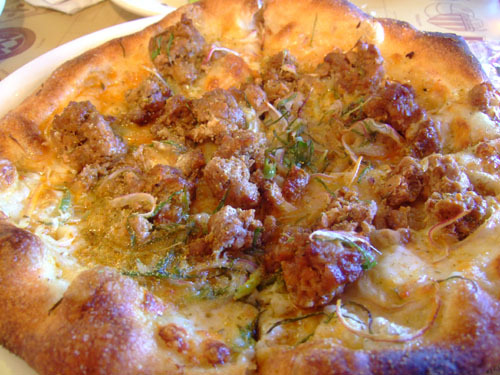 The pizza was topped with a house-made sausage, one with a subtle sweetness that really dominated the pie. However, the application of onions and scallions provided a tangy counterpoint to the meat, which helped in balancing things out. My dining companion preferred Ortica's "Salsiccia e finocchio" pizza, but I'm ambivalent. One problem here was that the pizza was extremely greasy, leaving large pools of oil on the plate. 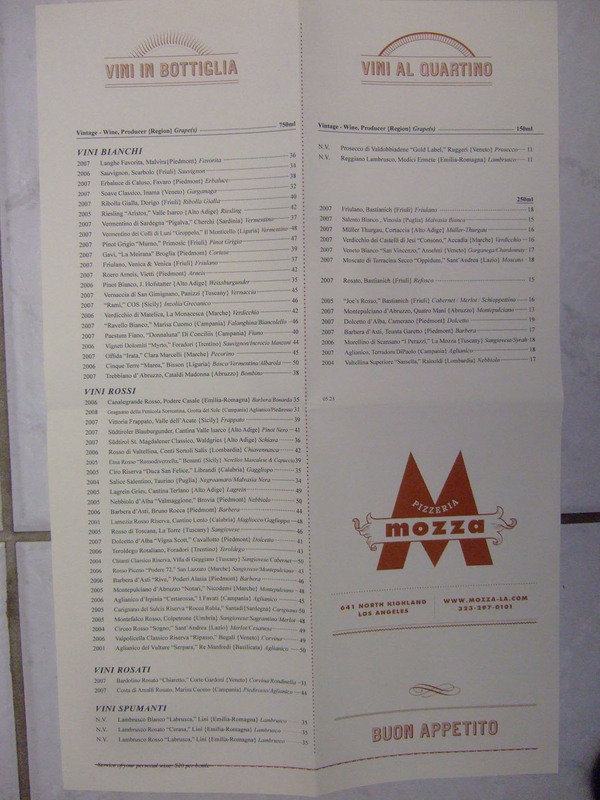 During my last New York trip, I wanted to try the famous Clam Pie at Lombardi's, but my dining companion balked; I thus wanted to get my fill of it here at Mozza. The essence of clam was extremely apparent in the pizza, and this was countered by an equally intense application of garlic--a logical pairing but a bit overbearing in this case. The duo of cheeses, meanwhile, added weight and flavor on the finish. One notable thing about this pizza was the clams' texture, which gave the pie a nice chewy bite. 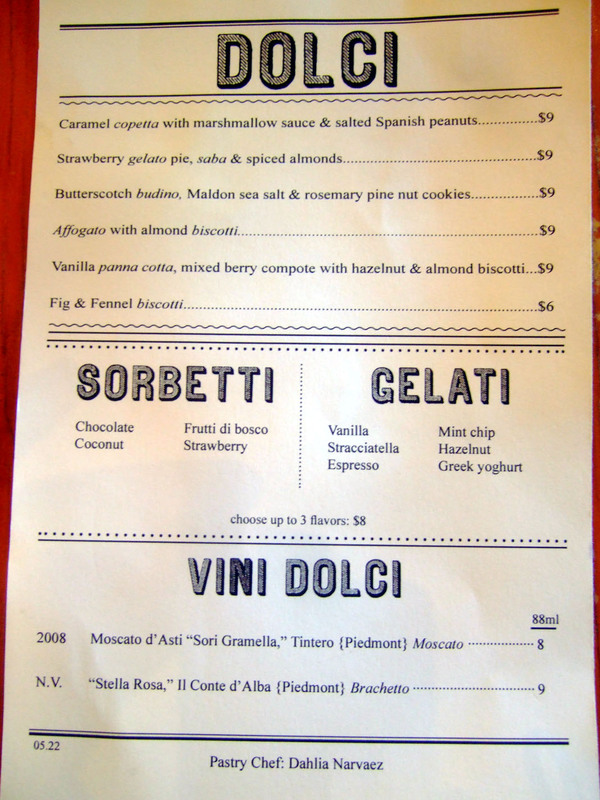 Yes, this was the infamous budino, as recommended by Christine during a blogger dinner at One Sunset. This dessert represented a fascinating study in the interplay between sweet and savory flavors. The pudding itself, as expected, was fiendishly sweet. It would've been far too monolithic had it not been for the use of rosemary and sea salt. The rosemary lent a pleasing tang to the dish, which helped in cutting the intensity of the butterscotch. The salt, on the other hand, gave the dessert a lingering savory finish that added much-needed complexity. Finally, the cookies provided a fitting textural contrast to balance out the creaminess of the dessert's other elements. 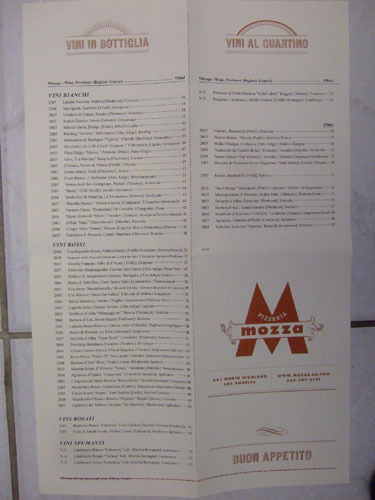 I knew coming in that Pizzeria Mozza wouldn't be deserving of all the hype, and it isn't. 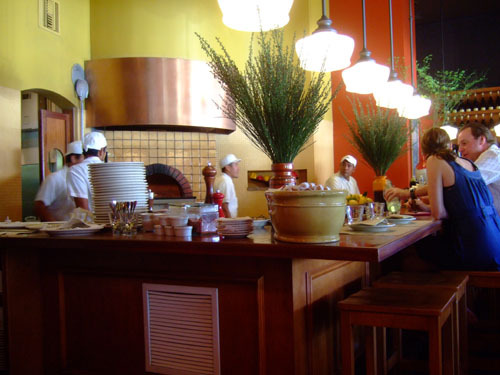 It is, however, a fun, casual spot, with a large menu of well-executed Italian fare. What more can I expect really? I will say that I'll probably be back. Shockingly, this is the most thorough review with the best pics I have seen of Mozza. Thanks for expanding my knowledge. I haven't eaten there yet, because everytime we have tried, it has been spontaneous. Denied every time. 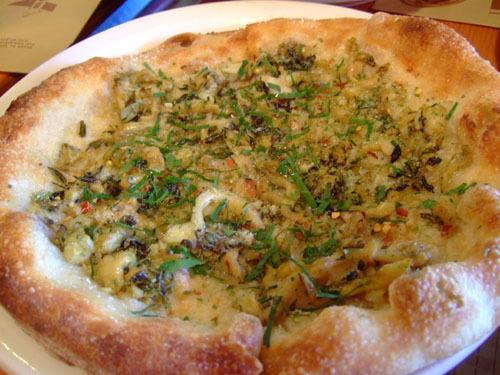 But right now my mouth is watering for some Ipsich clam pizza! Beautiful photos, but I don't see my favorite!! My husband and I have been going since the first week it opened, and have tried every pizza. But the one thing we MUST have on every visit is the chicken livers, capers, parsley & guanciale. Definitely order it next time, that is, if you like chicken liver of course! It's heaven. nice review, sorry it didn't live up to your hype. I think it's still a great spot, though I think your selection of pizza was a bit limited. Next time get a pizza with egg in it :) Also try the fennel goat cheese pizza - definitely lighter and more subtle in flavor, but excellent nonetheless. 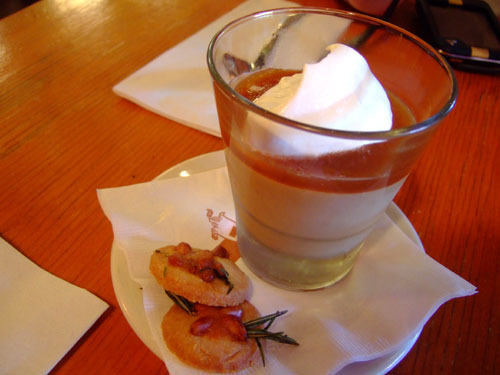 I still think that budino is heavenly. the meat antipasto plate to start with, the sausage pizza you had and the caramel dessert are my bread and butter. try getting the 3 or 4 different kind of mushroom pizza next time...hands down best mushroom pizza i have ever had. Even though it may not live up to the hype, the prices look great, and that's a huge plus in my book. Liz: Considering the throngs of foodies that have descended upon Mozza in the past couple years, that is quite shocking indeed. I'm surprised you haven't tried it though--here I was thinking that I was the last person to succumb! Jo: I prefer duck liver myself. ;) But I'll keep your fav in mind for next time; it sounds delish. Matt: Mmm, egg does sound good. Given the amount of hype surrounding the place, I figure it was pretty much impossible for Mozza to live up to expectations. It's still a nice spot though. Paul: Hey I got two out of your three, not too bad for going in blind! I'm a fan of shrooms, so I'll try to get that one next time as well. Sharon: You're right; the prices are reasonable, and I think that's part of the draw--Mozza appeals to a broad demographic, foodies and casual eaters alike. Yeah, I'd probably love the place more if it were more accessible, though now with the take-out pizza, it just might be. These pies are best eaten fresh though. Sure, you can go ahead and use the pic!